Pond Boss Fountain Pumps with Auto Shut Off have many attractive features with one of the most impressive being that these pumps have a built-in sensor that will automatically shut itself off when the water level gets too low, and turn itself back on when an adequate water level is reached. This feature will increase the longevity of your pump and prevent it from burnout. 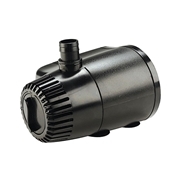 These pumps have an optional long lasting LED light for night time enjoyment. They are designed to operate quietly while still giving you a strong, consistent water flow so you can enjoy the beautiful sights and sounds of your water feature without any interruptions. All Pond Boss Fountain Pumps come with a 1 year warranty.